Everyone -- and we mean everyone -- needs some kind of recovery disc. It could be the only thing between you and losing critical data, or a lengthy (and possibly unnecessary) Windows reinstall, for example. Most PCs ship with some kind of onboard recovery or repair tools, but these are often limited. What’s the solution? 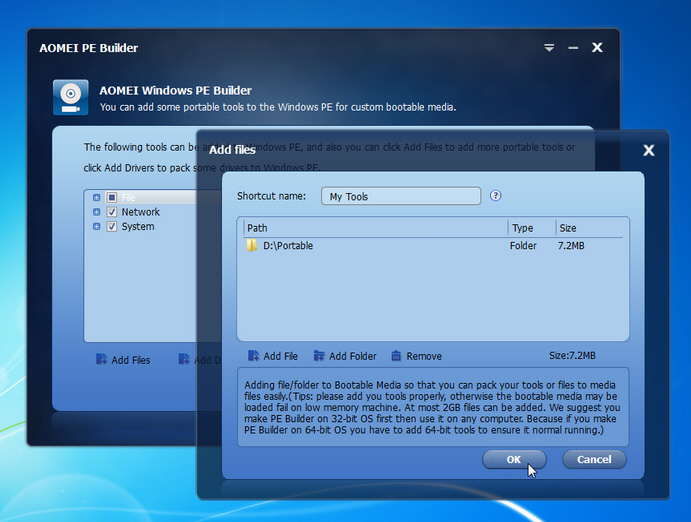 If you’re running Windows 7 or 8 (but not, as yet, 8.1), it could well be AOMEI PE Builder Free 1.0. As its title suggests, AOMEI’s solution is based on Microsoft’s own Windows PE environment, a cut-down (but graphically similar) version of Windows itself. You don’t need to download the hefty Windows Automated Installation Kit either to take advantage of this either; AOMEI grabs everything it needs during the boot disc creation process. The basic Windows PE environment provides you with a full Windows desktop complete with key Windows tools including critical Control Panels, the command prompt and Internet Explorer for troubleshooting over the web. But that’s not all: AOMEI PE Builder then adds in two useful AOMEI utilities: Backupper for recovering accessible files by backing them up, and Partition Assistant for more sophisticated partition management (including partition recovery), as well as a handful of portable tools -- including file recovery tool Recuva. The builder program itself requires Windows 7 or 8 to run -- surprisingly (for now at least) it won’t run on Windows 8.1 -- but the bootable media it creates can then be used on other versions, from XP all the way up to Windows 8.1 and beyond. Once launched, you’ll be stepped through a wizard putting the components together. You’ll see exactly which portable apps are supplied as standard, but you can also add your own portable apps here too, as well as any specific drivers you might want or need. Finally, you’ll be prompted to burn a CD, save to USB drive or create an ISO file, and your bootable recovery tool is ready to go on standby. And should the worst happen and your PC fails to boot, you’ve now got a means of booting into a familiar environment, giving you a great opportunity to troubleshoot your problem, hopefully find a Windows repair or at least recover critical data before taking more drastic steps. AOMEI PE Builder Free 1.0 is available now as a freeware download. The PE builder tool itself requires Windows 7 or 8 to run, but any bootable media created should work with PCs running other versions of Windows too.